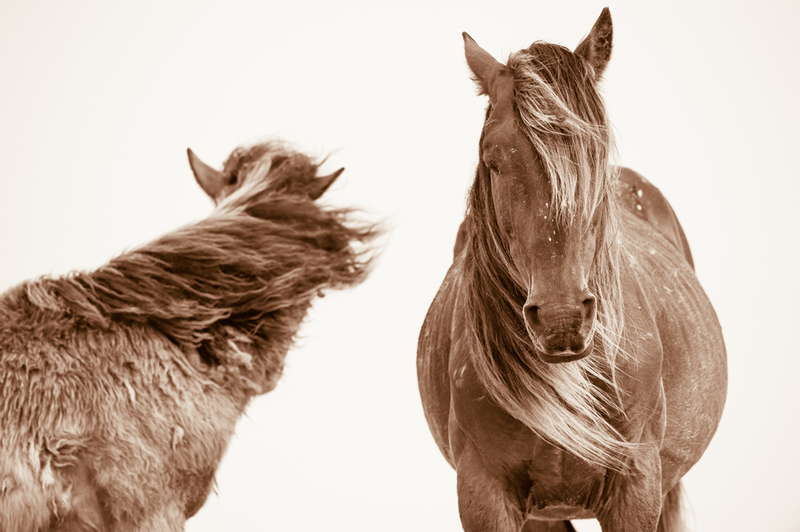 There is a pervading calm and rhythm that exists on the islands that are home for these wild horses and it seeps into everything that makes contact with their sandy surface. Life here moves at a slower pace than on the mainland, dictated by the comings and goings of the sun, the fluctuations of the tides, and intensity of the wind. The horses move accordingly. At times they seek shelter from the baking sun and periodic storms in the thickets of low growing cedars. At other times, the peaks of the gently sloping dunes provide just enough elevation to catch a gentle breeze. It was on one of those dunes that this pair stood, the stallion known as Wavelength and a young colt from one of his mares. It was late in the afternoon but the heat of the mid-day sun still hung heavily in the air. Wavelength stood motionless but for his ever flowing mane and forelock gently lifting in the easterly breeze. Completely relaxed, almost in a state of slumber, I watched his sides expand with rhythmic breath, occasionally interrupted by a forceful exhale. The colt too was quietly at ease, thou easily distracted by movements and sounds, neck turning to satisfy a curiosity. I marvelled in this moment for I was in the company of a wild stallion and his colt, surrounded by unlimited natural beauty, with minutes passing uninterrupted by artificial sounds. It was nirvana.